Citation PERSEA AMERICANA Miller, Gard. Dict., ed. 8. 1768. 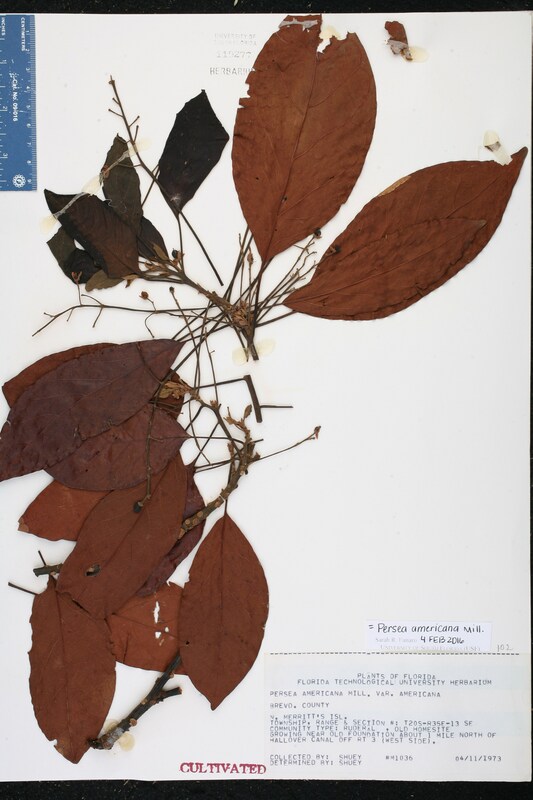 Basionym: Laurus persea Linnaeus 1753. Type: JAMAICA: Without data (lectotype: Sloane, Voy. Jamaica 2: pl. 222(2). 1725). Lectotypified by van der Werff, Novon 12: 580. 2002. Laurus persea Laurus persea Linnaeus, Sp. Pl. 370. 1753. TYPE: JAMAICA: Without data (lectotype: Sloane, Voy. Jamaica 2: pl. 222(2). 1725). Lectotypified by van der Werff, Novon 12: 580. 2002. Persea edulis Persea edulis Rafinesque, Sylva Tellur. 134. 1838, nom. illegit. BASIONYM: Persea americana Miller 1768; Laurus persea Linnaeus 1753. Persea gratissima Persea gratissima C. F. Gaertner, Suppl. Carp. 222, t. 221. 1807, nom. illegit. BASIONYM: Persea americana Miller 1768; Laurus persea Linnaeus 1753. Persea gratissima var. vulgaris Persea gratissima C. F. Gaertner, var. vulgaris Meisner, in de Candolle, Prodr. 15(1): 53. 1864, nom. inadmiss. BASIONYM: Persea gratissima C. F. Gaertner 1807, nom. illegit. 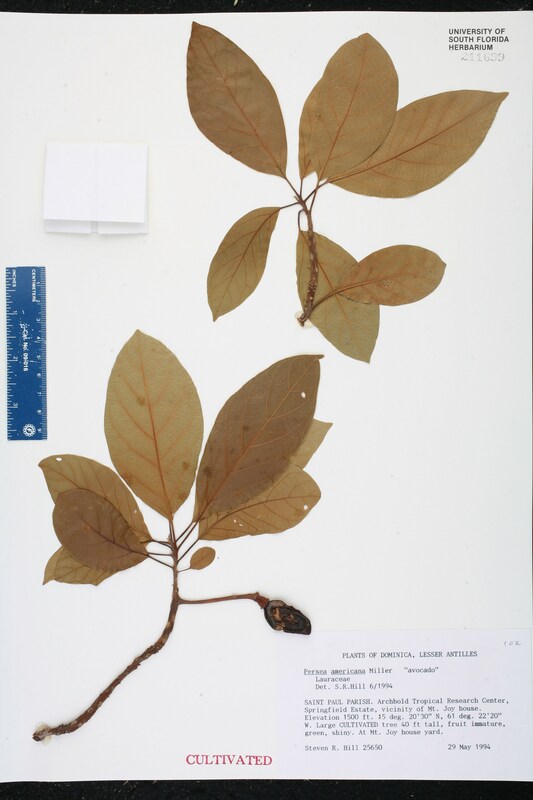 ; Persea americana Miller 1768; Laurus persea Linnaeus 1753. Persea macrocarpa Persea macrocarpa Rafinesque, Med. Repos., ser. 2. 5: 352. 1808, nom. illegit. BASIONYM: Persea americana Miller 1768; Laurus persea Linnaeus 1753. Persea persea Persea persea (Linnaeus) Cockerell, Bull. Torrey Bot. Club 19: 95. 1892, nom. inadmiss. BASIONYM: Persea americana Miller 1768; Laurus persea Linnaeus 1753. Persea americana var. angustifolia Persea americana Miller, var. angustifolia Miranda, Anales Inst. Biol. Univ. Nac. Mexico 17: 129. 1946. 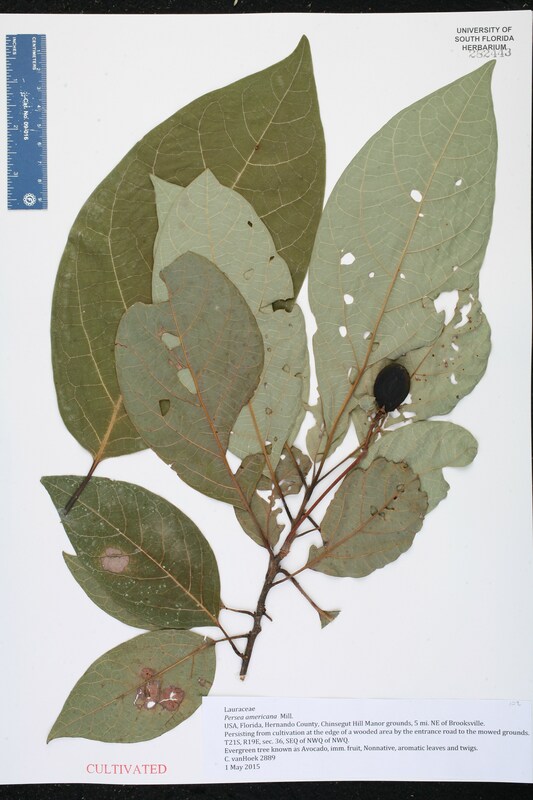 TYPE: MEXICO: Puebla: Without data, Miranda 3482 (holotype: MEXU? ; isotype: NY?). 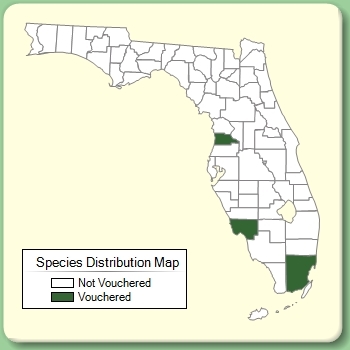 Persea americana var. drymifolia Persea americana Miller, var. drymifolia (Schlechtendal & Chamisso) S. F. Blake, J. Wash. Acad. Sci. 10: 15. 1920. BASIONYM: Persea drymifolia Schlechtendal & Chamisso 1831. Persea americana var. leiogyna Persea americana Miller, var. leiogyna (S. F. Blake) Kelsey & Dayton, Stand. Pl. Names, ed. 2. 474. 1942. BASIONYM: Persea leiogyna S. F. Blake 1920. Persea americana var. nubigena Persea americana Miller, var. nubigena (L. O. Williams) L. E. Kopp, Mem. New York Bot. Gard. 14: 19. 1966. BASIONYM: Persea nubigena L. O. Williams 1950. Persea drymifolia Persea drymifolia Schlechtendal & Chamisso, Linnaea 6: 365. 1831. 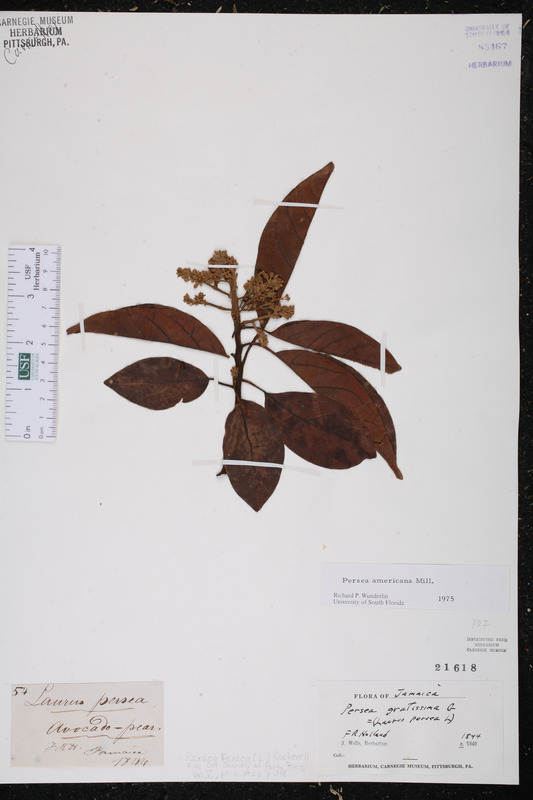 TYPE: MEXICO: Veracruz: Papantla, Mar, Schiede & Deppe 1140 (holotype: ? ; isotype: MO). Persea floccosa Persea floccosa Mez, Jahrb. Koenigl. Bot. Gart. Berlin 5: 148. 1889. 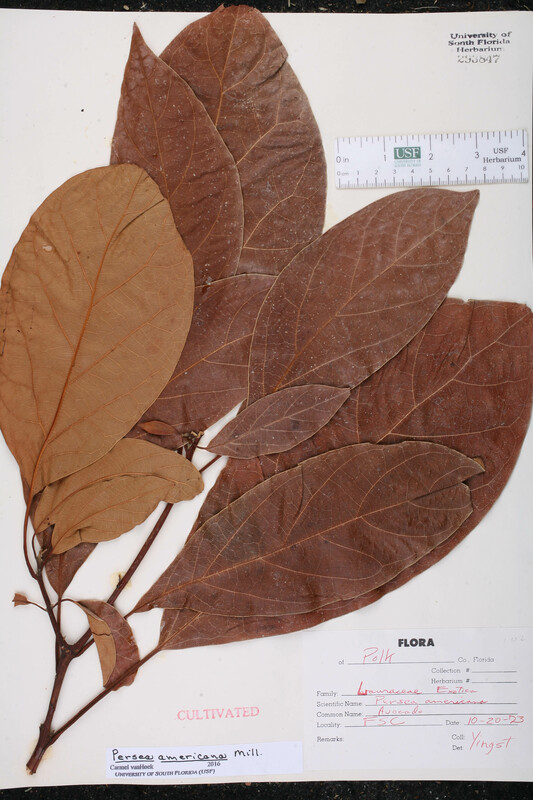 TYPE: MEXICO: Puebla: Near Chinantla, 1841, Liebmann 85 (holotype: B; isotype: C). 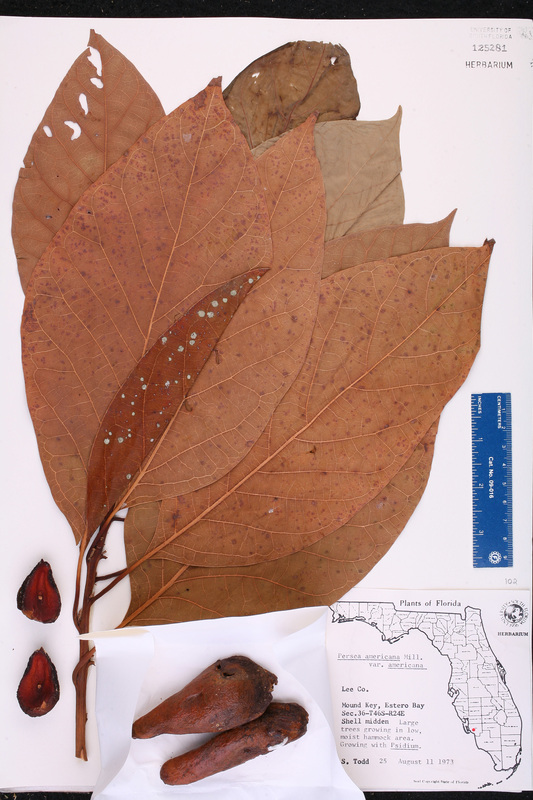 Persea gigantea Persea gigantea L. O. Williams, Ceiba 4: 39. 1953. TYPE: HONDURAS: Morazán: Mount Uyuca, 9 May 1947, Williams & Molina 12629 (holotype: EAP). Persea gratissima var. drymifolia Persea gratissima Gaertner, var. drymifolia (Schlechtendal & Chamisso) Mez, Jahrb. Königl. Bot. Gart. Berlin 5: 147. 1889. BASIONYM: Persea drymifolia Schlechtendal & Chamisso 1831. Persea gratissima var. 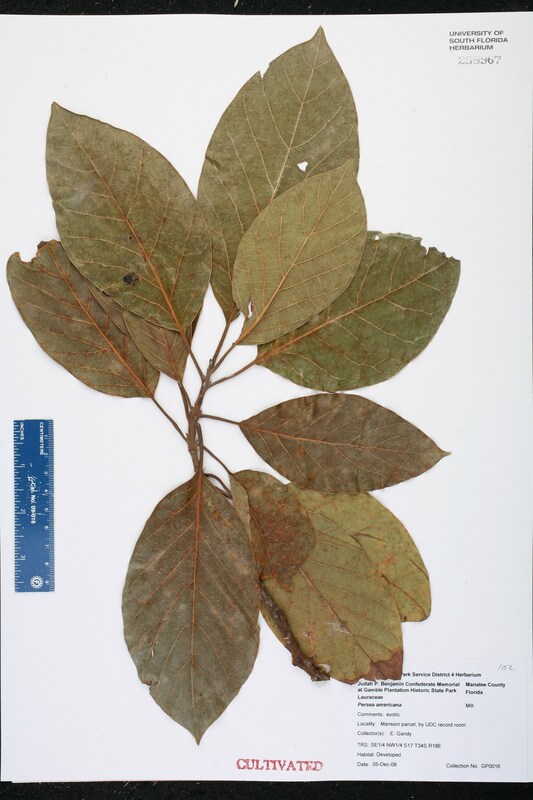 macrophylla Persea gratissima C. F. Gaertner, var. 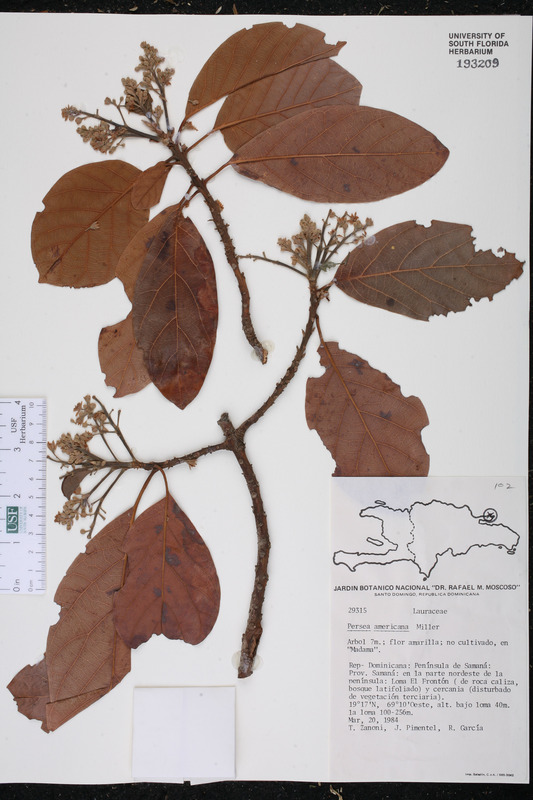 macrophylla Meisner, in de Candolle, Prodr. 15(1): 53. 1864, nom. illegit. BASIONYM: Persea gratissima C. F. Gaertner, var. praecox Nees von Esenbeck 1836. Persea gratissima var. oblonga Persea gratissima Gaertner, var. oblonga Meisner, in de Candolle, Prodr. 15(1): 53. 1864. Persea gratissima var. praecox Persea gratissima C. F. Gaertner, var. praecox Nees von Esenbeck, Syst. Laur. 129. 1836. 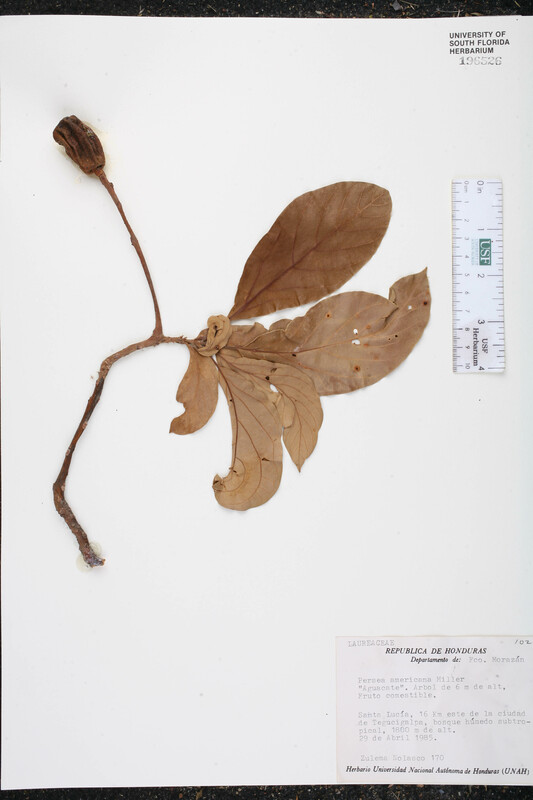 TYPE: PERU: Loreto: Yurimaguas, s.d., Poeppig 2446 (holotype: ? ; isotype: MO). Persea leiogyna Persea leiogyna S. F. Blake, J. Wash. Acad. Sci. 10: 19. 1920. TYPE: CUBA: Cult. 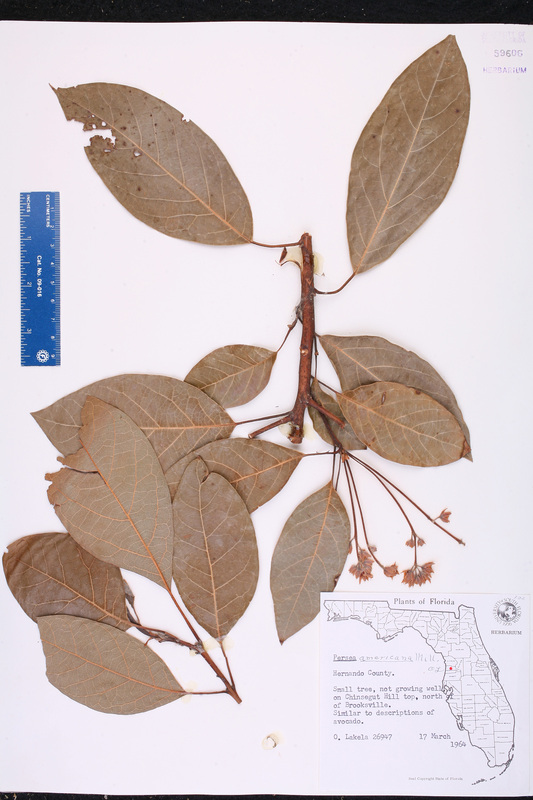 in Florida, Miami-Dade Co., Plant Introduction Garden at Miami, s.d., Popenoe 219 (holotype: US). Persea nubigena Persea nubigena L. O. Williams, Ceiba 1: 55. 1950. TYPE: GUATEMALA: Chimaltenango: Between km posts 97-98 along raod, Cerro Chichoy near Chichoy, 6 Jul 1949, Williams & Molina 16833 (holotype: EAP; isotype: F). 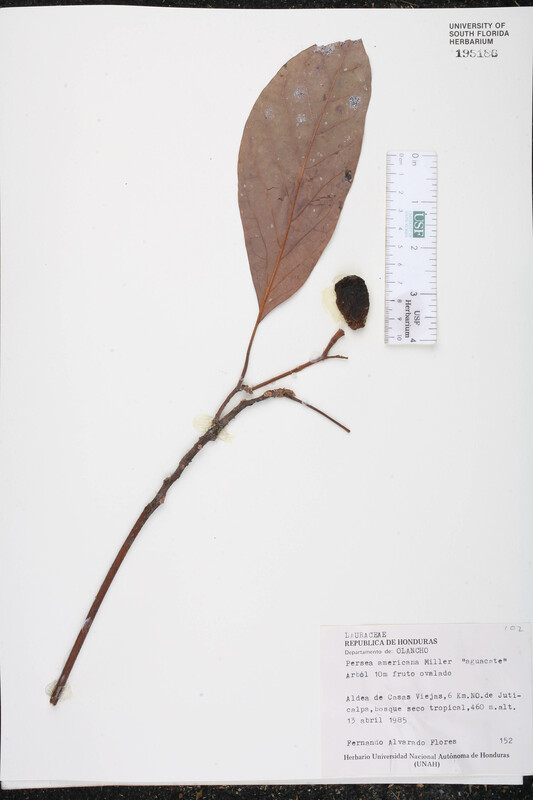 Persea paucitriplinervia Persea paucitriplinervia Lundell, Wrightia 5: 146. 1975. TYPE: GUATEMALA: Baja Verapaz: Unión Barrios, W of km 154 on the Cobán Road, 12 Apr 1975, Lundell & Contreras 19177 (holotype: LL; isotype: MO). Persea steyermarkii Persea steyermarkii C. K. Allen, J. Arnold Arbor. 26: 286. 1945. 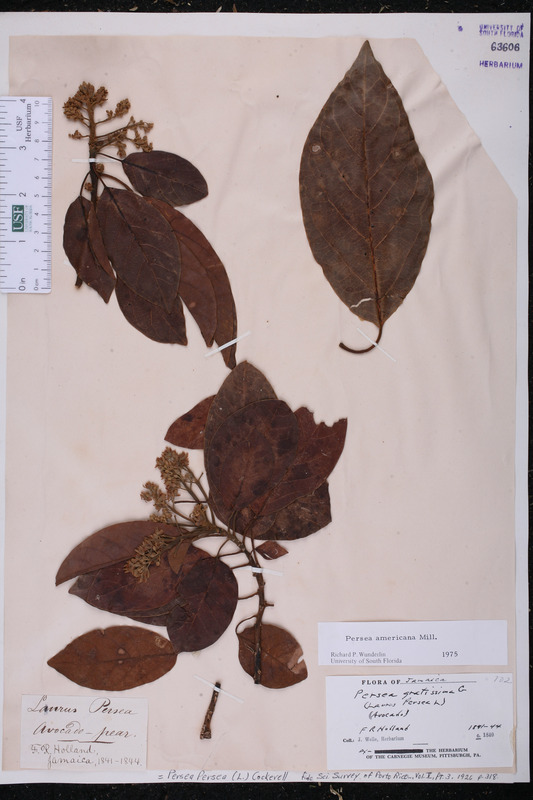 TYPE: GUATEMALA: San Marcos: Trail between Finca Porvenir and San Sebastián, upper slopes of Volcán Tajumulco, 1 Mar 1940, Steyermark 37061 (holotype: F). USA Florida Hernando Co. 01 May 2015 C. vanHoek 2889 CULTIVATED. Dominica St. Paul Par. 29 May 1994 S. R. Hill 25650 CULTIVATED. 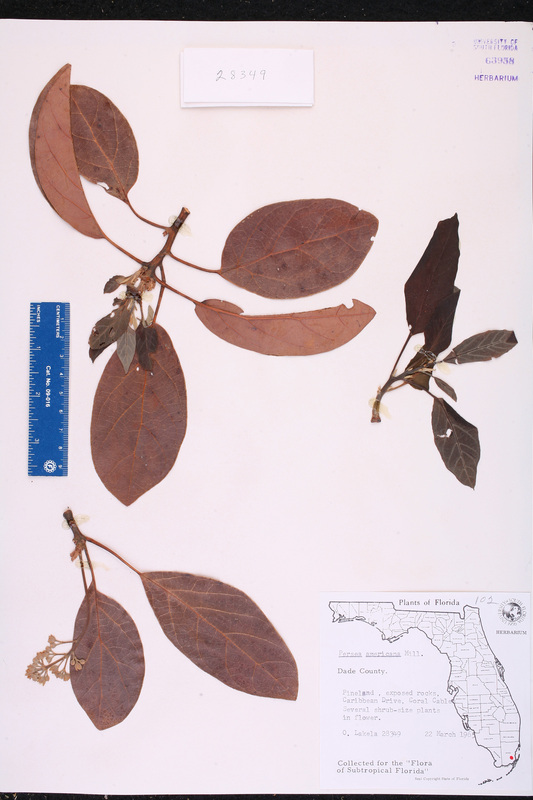 USA Florida Brevard Co. 11 Apr 1973 A.G. Shuey M1036 CULTIVATED. USA Florida Manatee Co. 05 Dec 2008 E. Gandy GP0016 CULTIVATED. Jamaica Cornwall Co. St. Elizabeth Par. 1844 J. Wolle s.n. USA Florida Polk Co. 20 Oct 1973 V. W. Yingst s.n. CULTIVATED.